Kid crafts are a must during winter in my house. Here in Ohio we can be shut in for days on end when the temperatures and wind chill dips below zero. Hi everyone! 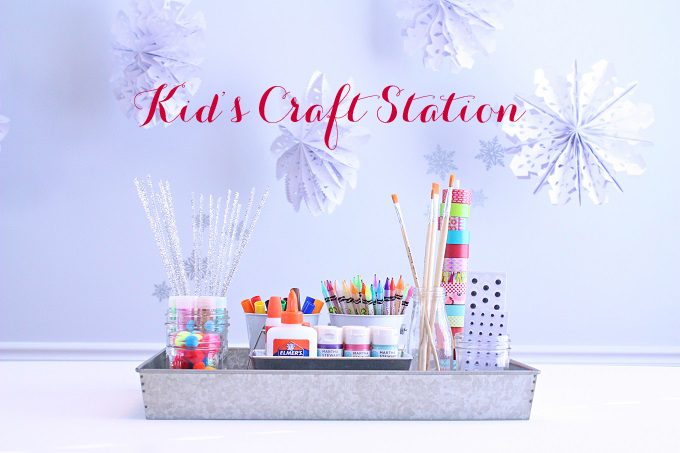 I’m Kim Byers of The Celebration Shoppe and here’s an easy idea to set up a mobile winter craft station to keep your kiddos busy on those long winter days. I set our kid’s craft station up in a tray so that we can store it easily and carry it from room to room. My kids like to be wherever I am and so sometimes that means they craft in my office… sometimes in the kitchen… sometimes in the living room. By using a tray to store all their supplies we can easily take it with us and the clean-up is much easier! Start by selecting the components of your craft station. For containers, I chose a variety of mini pails, mason jars, milk bottles and I made a washi tape stand out of a wood circle and dowel. For craft supplies, fill it full of the things your kids like most. My kids love googly eyes, pompoms, washi tape, paint and paint brushes, markers, crayons, glue, glitter and pipe cleaners. You could add craft punches, scrapbook paper, foam… the options are limitless when you shop JOANN Fabric and Craft Stores. This little project could also be perfect for a homework station to kick the year off right! As always, I hope you’re inspired to craft, bake, create and celebrate with JOANN!